This is one of three books we are to read before training. It is a very quick and fun read about the differences between cultures. The author divides the world into two basic “climates” and describes characteristics of both. Here in the northern U.S., we are what she calls a “cold climate” culture, though being as rural as we are, I think we tend a little toward the warmer side of the scale than more populated areas. Much of the undeveloped world she calls “hot climate” cultures. The main distinction being that cold cultures are more task-oriented and hot cultures are more relationship oriented. Although for many locations an actual colder climate weather-wise does correspond with a “cold climate” culture, that is not always the case; it can also be more urban vs. rural/tribal. Many of the differences she discusses are ones that I have heard or read about before–time, relationship-priority, group vs. individual identity, and privacy. I know Ted ran head-on into many of these in college with his Zambian roommate. The one that gave me the most pause, and that I still have trouble understanding is direct vs. indirect communication. Remembering this will be very challenging if we go to a culture that communicates indirectly. Even the author frequently had to ask her friends in Chile if they were using direct or indirect language. In societies that use indirect communication, the relationship is valued over accuracy. One example that she gives is of a flight attendant that offers a passenger coffee or tea. When the passenger requests coffee, she responds that they only have tea. To me, it makes absolutely no sense to offer coffee if there is none available, but it is done in order to establish a friendly atmosphere–the literal meaning of the words is not as important as the contact established by their use. Another example that really saddens me is of colleagues from Europe and Nepal. When the Europeans go to visit their Nepali colleagues, they often ask for a guided trek into the Himalayas. Because of their culture, the Nepali are required to answer yes. The Europeans took them at their word, and the Nepali men then had to sacrifice money and their families to go on the trip. She gave many more examples of this–most of which I had just as much trouble wrapping my head around. The thought of trying to remember not to always take people at their word and to not say things I think myself straight out is rather mind-boggling. She does give a couple ideas for finding the “truth,” but they are (surprise) quite indirect. It’s all about the friendliness, not the information. The author had many stories in this book to illustrate each of the differences. They were very eye-opening and gave me a lot to think about in regards to relating with people in a different culture. About a year ago (Do you sense the theme here? God has been preparing us for this long before we even imagined it. ), we were starting to feel overwhelmed with all the “stuff” in our house. 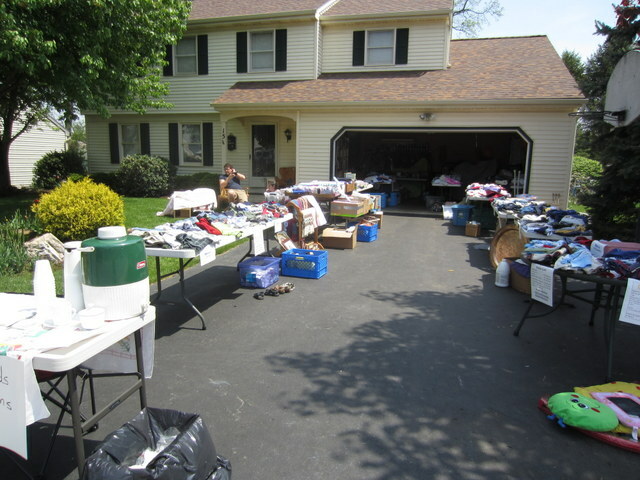 We began to sort and toss and clean, with the plan that I would have a yard sale this spring to get rid of it all. Fast forward a year, through a pregnancy and the birth of a baby, and we had quite a pile of stuff to get rid of. I had decided that it would be best in many ways to have the yard sale at my parents’ house. So, a couple weeks ago, we loaded it all up in two vehicles and headed south. Ted and I decided that any money we made at the yard sale would go towards our trip. It makes a difference when you are sorting through stuff if you have to think about the possibility of storing it for a year or so! We got the stuff to my parents’, sorted through it all, advertised, and opened for business Friday morning. 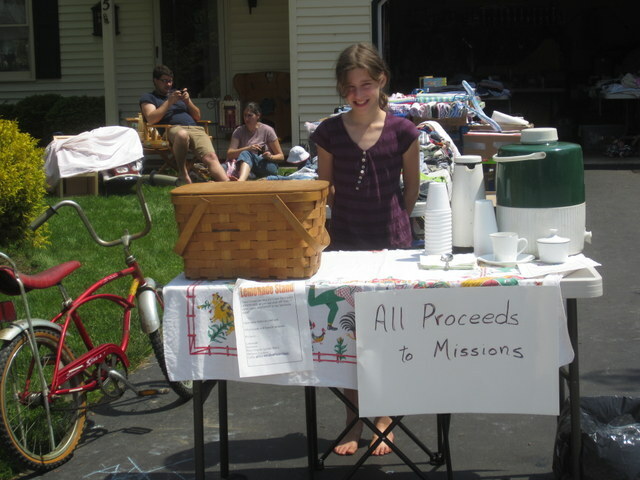 Daisy had her own coffee/lemonade stand too as she wanted to help contribute. All told from the yard sale and selling off the rest of my fabric on craigslist afterward, we made…$1000!! We won’t know how much money we need to raise until we figure out where we are going, but we are now $1000 closer than before! Praise the Lord! Today, Ted had a chance to talk with EMM’s Business for Transformation Coach on the phone. They discussed several more locations where we could be used to help with business projects, some of which really resonated with Ted. So now we have even more places to research and pray about as we continue to discern God’s will for us. A couple we are looking into further are in Albania and Kenya. Once we were approved to work with EMM, things began to move rather quickly–at least much more quickly than I had anticipated. The same day we got our approval, we also received descriptions of three different opportunities. 1. Teaching in Cusco, Peru, a very modern city, We had this location in mind already–mostly because we knew something about it as a team from our church had gone there seven years ago to help with building the school. 2. Assisting with a chicken feed business in Central Asia — in a former Soviet republic northwest of China that is working to recover economically from years of Soviet rule. Though there is a small church there, the numbers have actually been falling because so many people are leaving the country looking for a better life elsewhere. Much of the work here would be relationship building, and learning the language is critical. We have been told this description will soon be updated to include some type of coffee shop business. We are looking forward to seeing the new description. 3. Working to support the K’ekchi’ In Guatemala as they worked to build a fair trade coffee business exporting coffee to the United States. The K’ekchi were Mayan Indians, and historically, they have not been treated well by the government. This position would involve working with the government and farmers to make the businesses successful. I imagine a very good command of the Spanish language would be necessary. We are currently praying about all of these opportunities to see where God wants to use us. We are drawn by different aspects of all three of them. At the same time, EMM has encouraged us to attend a month-long training event next month. This is a bit sooner and longer than I had been expecting. So we are scrambling a bit to figure a bunch of things out before then, as well as how to put our lives on hold for a month, but still come back to them, as it will likely be several months after that before we leave on our trip–we will have to raise quite a bit of money first. Even so, we are looking forward to the training. We have already received two of the three books we are to read beforehand. They are good reading and have given us quite a bit to think and talk about. The wonderful thing is that they also work with the children to talk about missions and things they can do. The have one person entirely devoted to helping the children. Daisy understands and is excited about the trip, albeit a little apprehensive. Cub knows we’re talking about taking a trip somewhere else, but I don’t think he really understands all the implications of what we’ll be doing or how long we’ll be gone. Chimp and Rosebud are both pretty much clueless, though Chimp does participate sometimes when we practice in other languages. About 15 years ago, Ted and I were at Messiah College and we came across some literature from Wycliffe Bible Translators. They were looking for ethnomusicologists and computer programmers. “Huh?” we thought, “That sounds kinda like us.” It was a fun idea, but we didn’t really feel called, and we had other plans at the time. Once in a while over the next 14 years, we would occasionally talk and dream of someday traveling around the world with the kids (once there were kids). I always said we needed to wait until the kids were all older–old enough to remember the trip! Then, last September, when I was 8 months pregnant with Rosebud, we went to the New York Mennonite Conference’s fall Celebration. While wandering around there, trying to keep a certain 3-year-old from disrupting the service, I was browsing the information tables and I came across Eastern Mennonite Missions’s (EMM) Missionary Messenger magazine from last September. It happened to be about Families in Short-Term Missions. 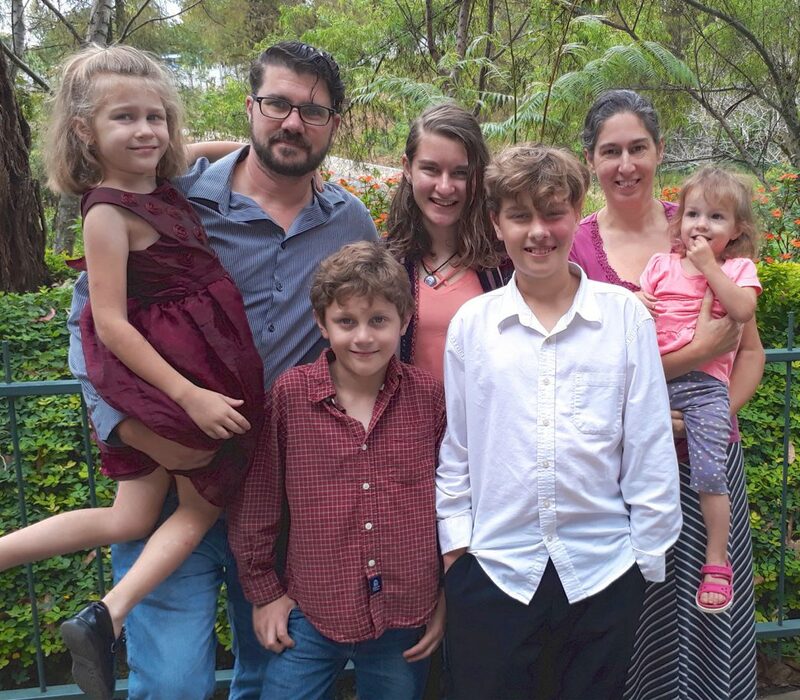 I had never really thought about the possibility of us taking an international trip that included missions–especially as a family and just on a short-term basis. I picked up the magazine and read it through, but then I put it away. It sounded great, but still wasn’t something I was ready to consider anytime soon. Fast forward about six months. Rosebud is now just over four months. Ted is at a place in his career that allows him to take some time off. He was looking for some ideas of things to do and came across a missions website. A while later, he handed me the computer with this page open and said, “This is what I want to do.” Then, an absolutely amazing thing happened: I looked at it, sat down and read through the options, and said, “Yes, we should do this.” Then I pulled out the issue of Missionary Messenger that I had tucked away and gave it to him. God had been working on me behind the scenes without my knowledge, and the time was right! We had already planned a visit to my parents for three weeks later (to have a yard sale to clear out loads of baby clothes and others things we had accumulated over the years). Since my parents live in Lancaster County, where EMM is headquartered, we setup an interview for during that visit. Thursday morning we had a wonderful interview with a placement coach from EMM. By that afternoon, we were officially invited to pursue a GO! assignment with EMM!